Hannah in Cleveland, Ohio, has just received an extremely special Seizure Response Service Dog from SDWR. 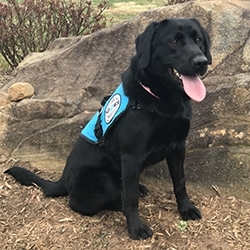 Cleveland, OH, April 10, 2019 --(PR.com)-- A 22-year-old woman named Hannah living in Cleveland, Ohio, has just received an extremely special Seizure Response Service Dog from Service Dogs by Warren Retrievers. Service Dogs by Warren Retrievers, or “SDWR,” has a mission to provide specially bred dogs for individuals of all ages with invisible disabilities like Autism Spectrum Disorder, PTSD, Diabetes, or in the case of Hannah — Seizure Disorder. In addition to hundreds of working dogs already placed, there are over 400 families enrolled in SDWR’s program awaiting their service dog delivery. Hannah was diagnosed with epilepsy as an infant and with schizencephaly at the age of 18-years-old. Hannah's epilepsy severely limits her independence and causes her emotional distress by worrying about having a seizure. With Rose by her side, Hannah is confident that having a Seizure Response Dog will provide her with the independence she needs to face the everyday challenges of living with epilepsy. Rose is also an honored graduate of the SDWR Fallen Officer Puppy Program. The Fallen Officer Puppy Program, also known as “FOPP,” is an initiative by SDWR to pay respect to the legacy of service by fallen American police who sacrificed their lives in the line of duty. Rose is named in honor of fallen hero Deputy Sheriff Rosemary Vela of the Madison County Sheriff's Office in Tennessee who was killed in a single vehicle crash while responding to backup another deputy. Rose’s work as a Seizure Response Service Dog with Hannah will carry on in memoriam of Deputy Sheriff Vela’s life of service before self. With the new arrival of Rose, Hannah will have a four-legged tool that has received foundational training to not only assist Hannah during seizures, but also help her to live a more independent and less anxiety-filled life. Thanks to the Americans with Disabilities Act (ADA), Hannah’s service dog will be able to accompany her everywhere-- from going to restaurants, to running errands, and even to work. Service Dogs by Warren Retrievers is a non-profit organization based in Madison, Virginia, and relies on donations to help the organization in its mission, “Until there’s a cure … there’s a dog.” To make a donation or learn more about SDWR, please visit the website, http://www.sdwr.org. To learn more about Seizure Response Service Dogs visit http://www.sdwr.org/service-dogs/seizure/. To find out how you can volunteer or serve as a service dog raiser visit http://www.sdwr.org/volunteer-opportunities.